Last week, I did something I never thought I’d do. 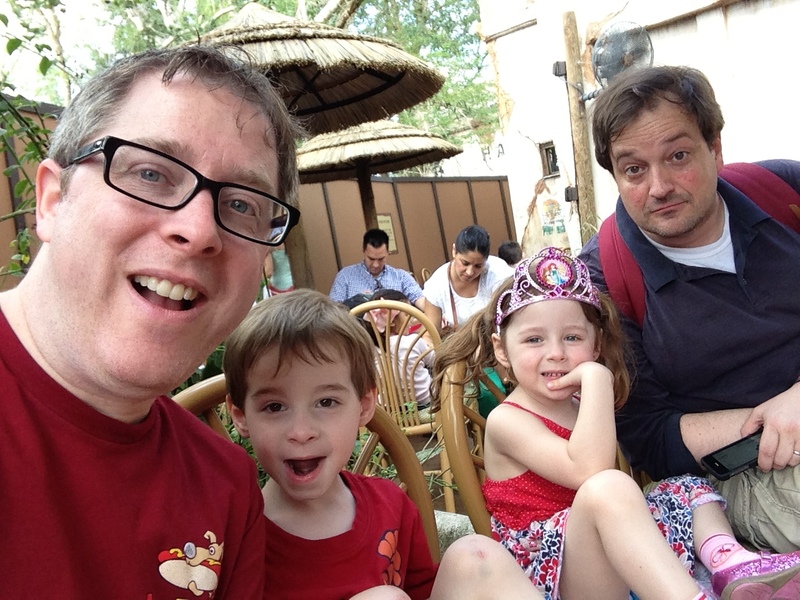 I went to Disney World as a dad. The last time I’d been there, I was pretty much still a kid myself — 20 years old and just coming to terms with being gay. Everywhere I looked in Orlando, I saw dads. They were buckling their kids into the Dumbo ride and hoisting them onto their shoulders to watch the Main Street Electrical Parade. They all had big smiles on their faces, and they all had wives. With that visit, Disney World became Exhibit A of what I was sacrificing by coming out of the closet. I’ve written a whole book about how I got from that point to fatherhood, and I’m happy to say that twenty years in the future, life looks a lot better than I ever expected it would. 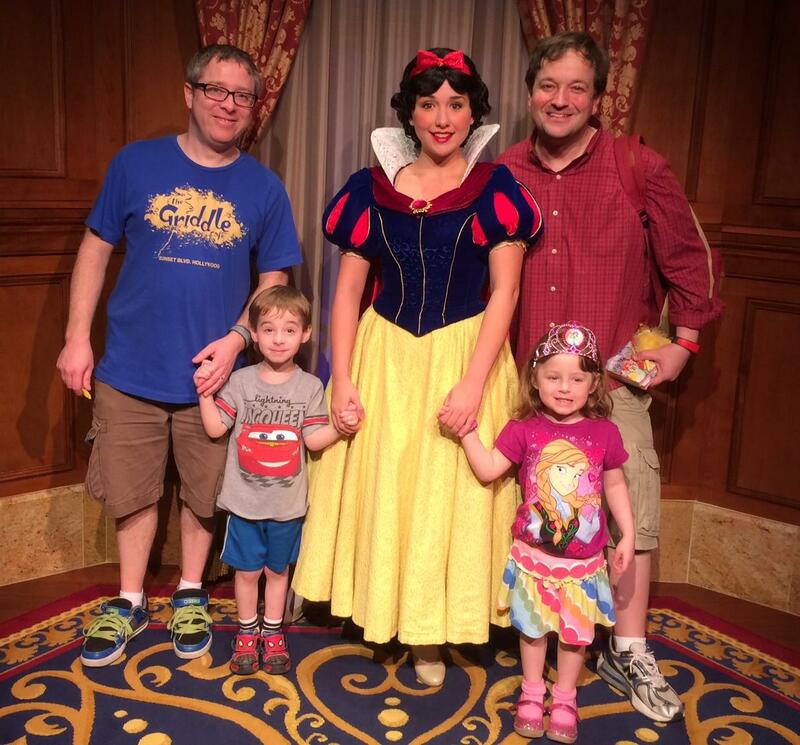 As soon as Drew and I felt the kids were old enough to appreciate a Disney vacation, we booked our trip. I had just a tinge of nerves as the four of us headed for the airport. We’re never more visible as a family than when we travel. Nothing says “We file taxes jointly” as clearly as sharing a Lion King suite in a Disney hotel. And I doubt any place in America draws such a cross-section of Americans as Orlando. I was sure we’d bump into some people who wouldn’t find our family… let’s say, family-friendly. We’d barely stepped through the front door of our hotel when an eager employee — er, I mean cast member — strolled up to us and asked if we needed to check in. “Well, I was told I’d get a text when our room was ready, and it hasn’t come yet,” I told him. “Hmmm, let me see,” he said. He took down my name and disappeared behind the check-in desk. Of course I knew what he meant. The cast member who was helping us was gay (“family”) himself, so he was being extra nice to us. Moments later, we were upstairs in a fantastic room on the top floor. Though I’d planned all our meal reservations months in advance (which you have to do if you want to eat at the good spots), I needed to make a change to one. I was not optimistic I’d be able to get what I wanted, but I picked up our hotel phone and dialed the reservation line. “So this is for you and… Andrew?” the man on the other end asked, reading my information off his computer. “Aw!” he said. I realized that once again, we were getting the family treatment. He fixed my reservation and waived the change fee. It’s then that I realized something that would become even clearer to me throughout our vacation: a LOT of gay people work at Disney World. And as I’ve already learned, gay people love to see gay parents. Thanks to them and all the other wonderful people who work at the Magic Kingdom, I felt completely safe at Disney and never had any second thoughts about whether my family belonged there. We spent our vacation like pretty much everyone else. We dined with everyone from Donald Duck to Tigger to Stitch to Sleeping Beauty. 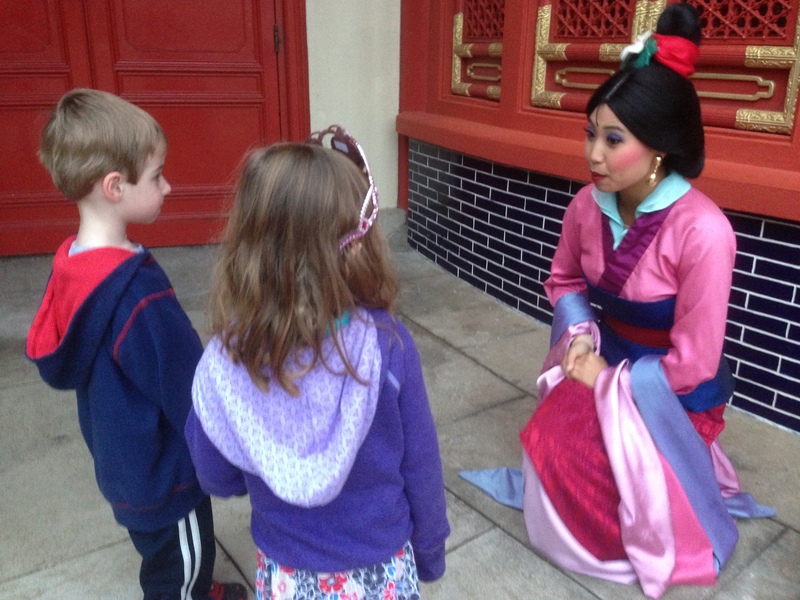 We stalked Mulan through Epcot’s China pavilion so the kids could get her autograph, camping out on a tip that she was going to make a surprise appearance. (Success!) We spent roughly half our kids’ college funds on Disney merchandise. Instead of feeling self-conscious about our family, we felt… well, special. 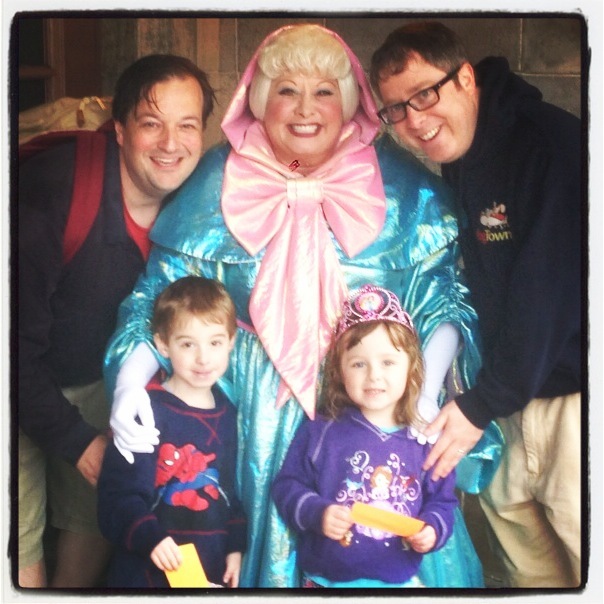 As we stood on Main Street waiting for a lunch reservation one day, a cast member approached us in character and said, “You have a beautiful family! The four of you, I love this.” She pointed at each of us, just so we knew for sure that she understood exactly what kind of family we had. Of course, we did, and she greeted us like old friends. This was a woman who probably spoke to hundreds of families a day, but precisely because we were a little bit different, she remembered us. It made me realize once again that it’s better to stand out than to blend in. Any fears I had about people reacting negatively to our family were unfounded. As I’ve noted in other posts, the nice people we come into contact with tend to be extra-nice to us, and the homophobes are at least polite enough to stay out of our way. Becoming a dad was a major life victory for me, but it was hardly the last one. It’s been followed by innumerable others, the most recent of which came last week, when I took my family to Disney World, just like anyone else. And it was even better than I’d imagined. If you’re a regular reader, you may already know to skip the part after the asterisks, because you’ve probably already subscribed to my blog and followed me everywhere else, too — and geez, when’s he going to stop asking? 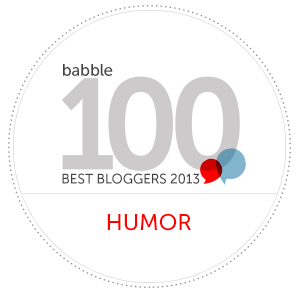 Those of you who are still reading — what are you waiting for? Subscribe, like me on Facebook, follow me on Twitter — and hey, as long as I’m shamelessly groveling, why not mark my book as “to read” on GoodReads? That’d be swell.